I recently received the new Pottery Barn Teen catalog, and came across one of their new collections featuring the Maison Gold Dottie Bedroom and fell in love. Take a look. 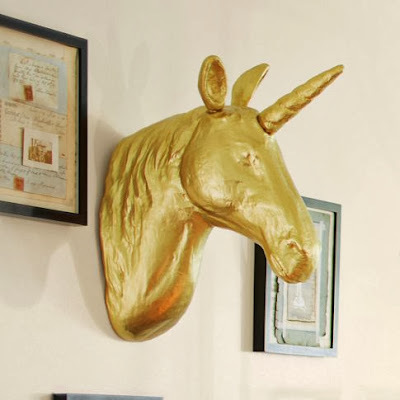 I love the whimsy of this room, and more importantly I love that gold unicorn! I am such a fan of an animal head here or there. I use them to hang awards, scarfs or necklaces from. 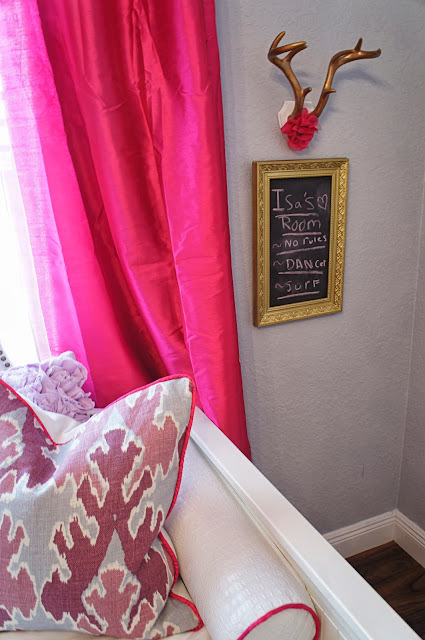 They just make the prettiest little vignettes, don't you think? Well, sadly this guy is $99 and I wasn't about to spend that so I held off. I just happened to go to Target and saw all of their new holiday decor (YAAAAY! ), when I found what I thought to be a suitable alternative. You can see the entire collection from Threshold here. 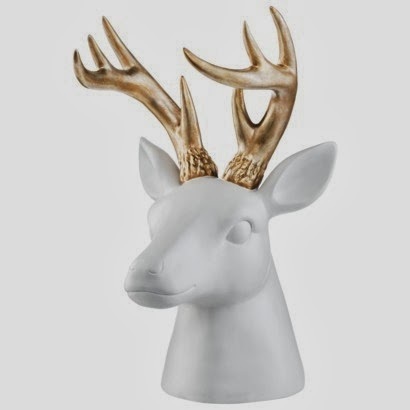 Now I know they aren't unicorns, but at prices from $19.99-$39.99 and in the finishes of all white or gold and silver antlers they will do the job just fine. I settled on the mounted horns in gold as shown above for only $19.99. 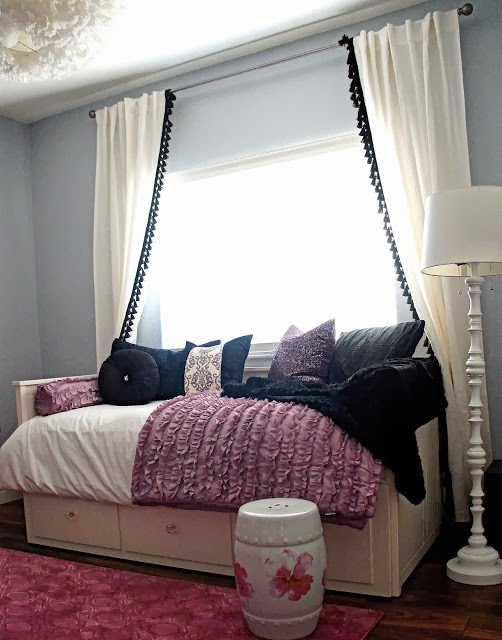 I needed them to complete a little area beside my daughter's bed, and that they did!. I modified them a bit by gluing a flower to them just to make them even better. Take a look at the finished product. 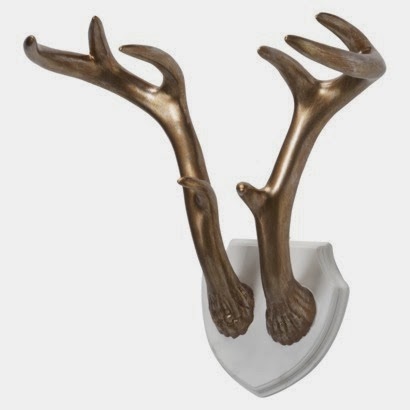 The horns were only $19.99 and the chalk board I found on clearance for $7.00 years ago and spray painted it gold. 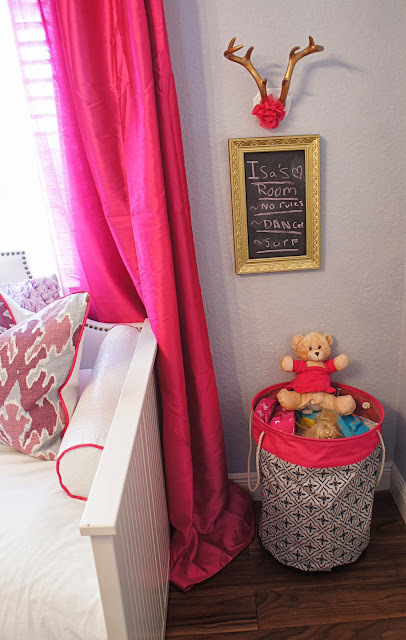 I'll probably put her toy basket underneath when it's all said and done which still works with the colors and contains all her toys and "stuff". Though I still love the unicorn this works and it saved me $80 bucks! I'll take that any day. As all the holiday collections at Target go, they sell out fast. 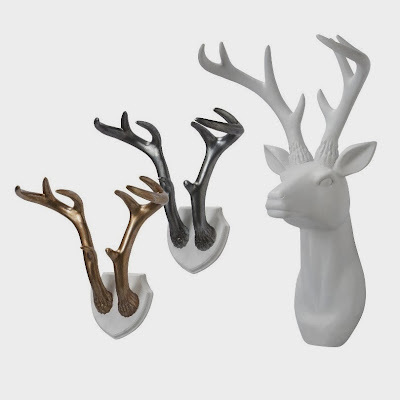 If you want your own budget worthy "stag head collection", you better go quickly before they're all gone. 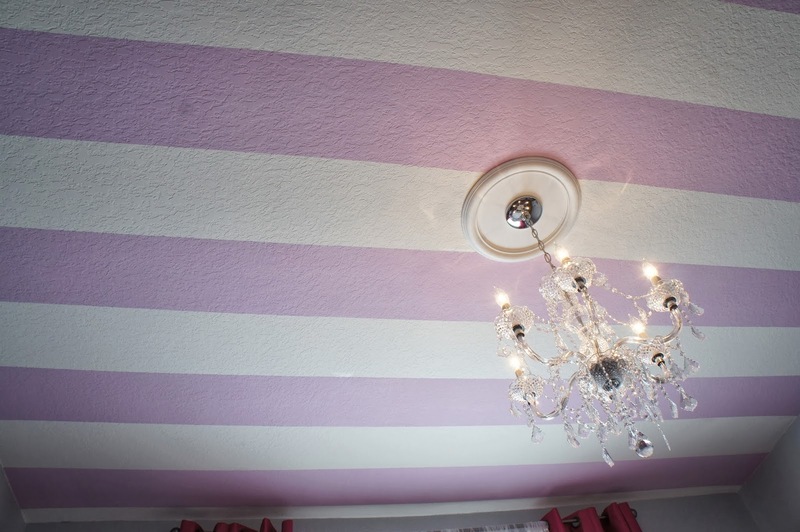 Next up in Isabella's mini room makeover, the striped ceiling which was actually painted twice. **Spoiler alert, there's a new chandelier! Here's your sneak peek. Since adding the finishing touches to Amanda's awesome teen room seen here, I decided to make a few updates also to Isabella's room per her statement "my room looks like an old grandma lives here", kids can be so charming;) I didn't want to change everything, but rather step things up a notch by adding more color, modifying her bed, and overall giving it a dose of "fun" (as opposed to old grandma like which is apparently not fun). 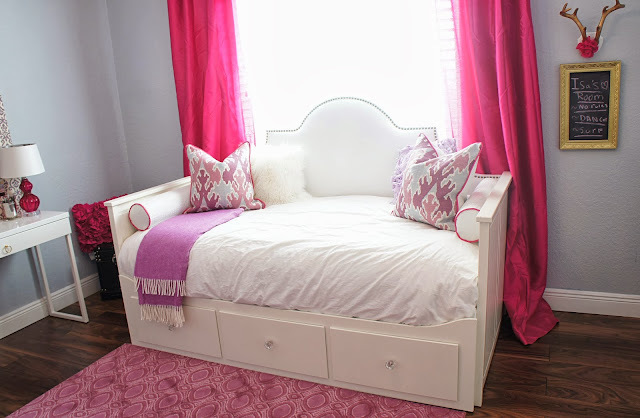 One of the biggest challenges was working with her Hemnes Day Bed from Ikea since I don't want to spend the money to replace a perfectly good bed, but I did want to somehow make it better. Here is the day bed as it's sold. If you're unfamiliar with this bed, let me help you out. 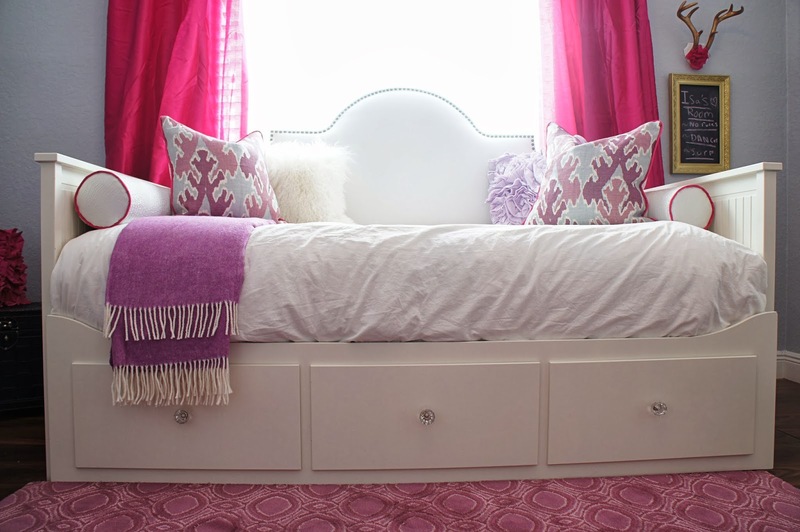 It's a basic white day bed that has 3 drawers for storage AND the ability to turn in to a double bed without losing the drawers and their storage. The best part is that for only $299 you really can't beat it. The problem is that as you can see, it's pretty basic. 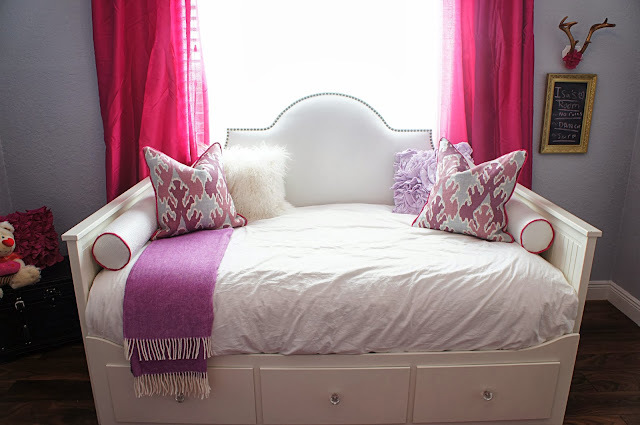 What I want is something more, something like these lovely day beds with their unique take on an upholstered head board. 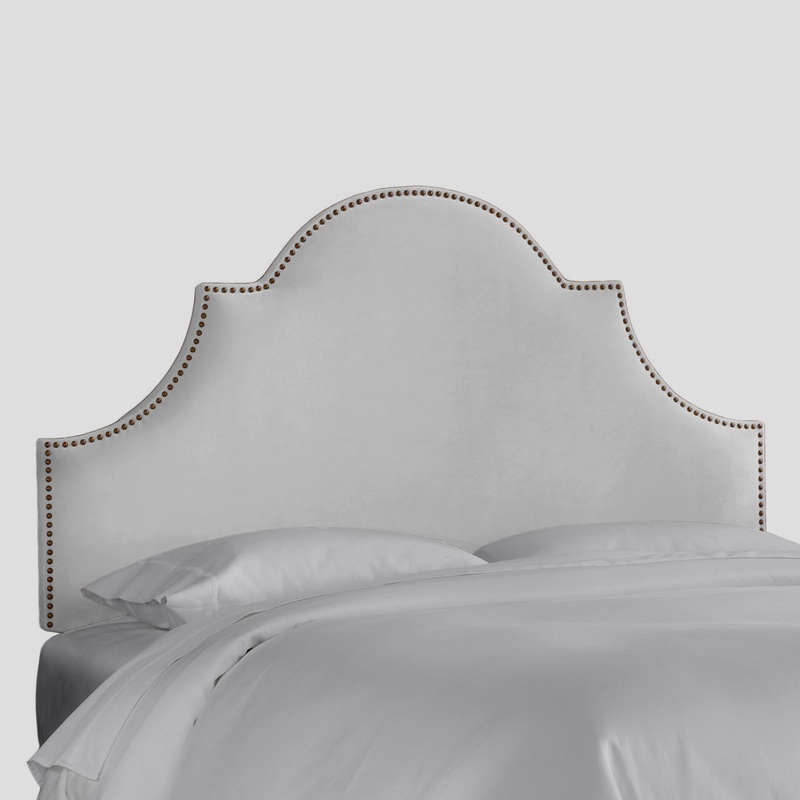 I think that the head boards on these beds take them from average to amazing, and that's exactly what was looking to do. But how to make that happen? I thought about having something made custom, but anyone who knows custom knows there's is always a high cost for this. I needed something easy and more affordable. I discovered that the length of the Hemnes day bed is 78 3/4", which is very close to the width of a kind sized bed which measures 78". Close enough. I decided to buy a prefabbed headboard from Skyline Furniture through Wayfair.com that you can find here. It's the perfect shape for what I was looking for and with near perfect measurements. It has a nail head trim which I love and it was the most affordable option that I found at about $370. As a side note, you may want to look on JossandMain who frequently has sales on Skyline furniture. 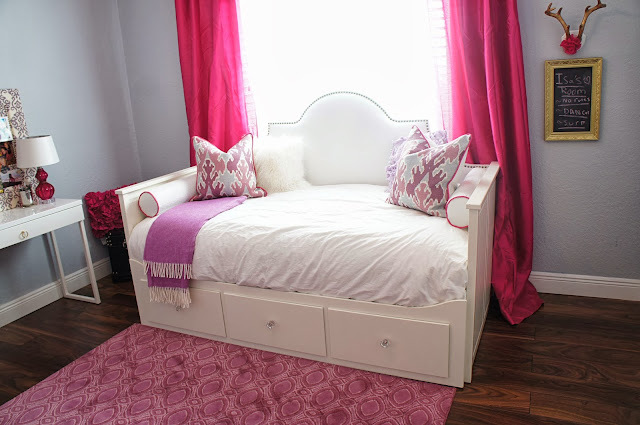 Take a look at the before and after for my Ikea Hemnes Day Bed Hack. 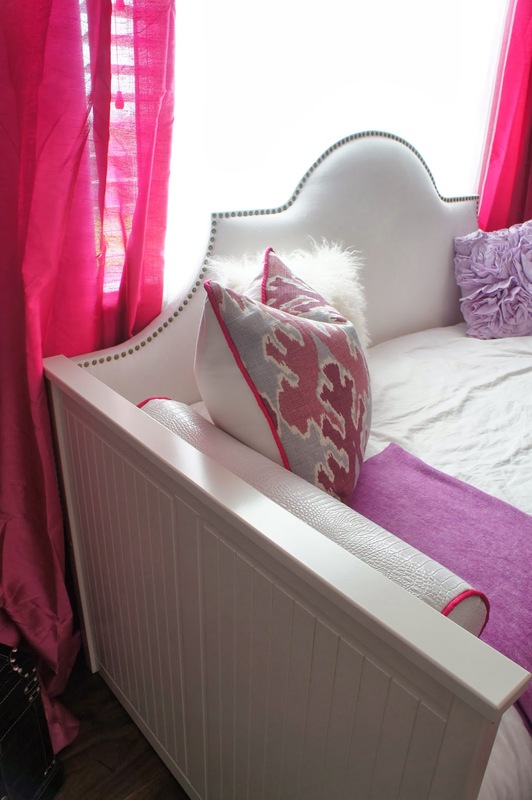 Here is a step by step on how make your own Ikea Hemnes day bed have an upholstered headboard. First we took the back panel of the day bed and cut 12" off the top to allow us to move the new headboard down a bit so that it doesn't block the window. We also removed the decorative trim off the top of the back panel which comes off by simply lifting it (it was only held in place by wood dowels.) 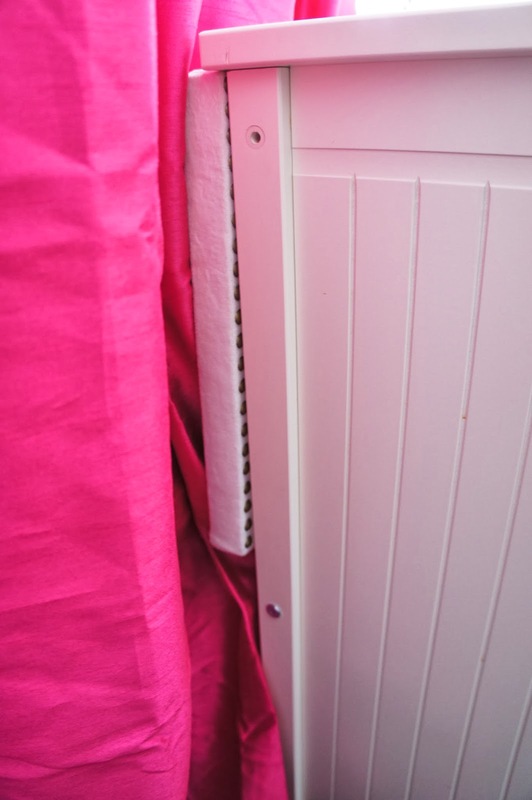 You will lose the top bolts that are on the back of the bed, but don't worry the new headboard will provide the support the bed needs. We then placed the headboard flush to the back of the bed and the bottom of the headboard flush against the top of the back support panel. We did not use the metal beams that come with the headboard, in this case they are not needed. Simply place a screw at the top and the bottom of both sides of the headboard, screwing directly through the back of the headboard in to your wood bed frame. That's it! It really was that simple to convert this bed. Below is a picture taken to show you the side of the bed where there is a missing bolt from cutting the support panel. If your bed were showing from the side you may need to modify the headboard because as you can see there is a bit of it that you can see. In my case it works perfectly fine since the bed is flanked by curtains. Take a look. Voila, nothing seen on the sides;). It was absolutely worth it! It makes the bed look so much more custom and glamorous as opposed to your standard big box store version don't you think?! And it was so easy!!! Stay tuned for the rest of Isabella's room including the painted stripes on the ceiling. You heard me correct, I painted stripes on the ceiling, and I learned a hard lesson along the way that I plan to share with you to save you the headache I went through;) I'll also cover the details on the color, those amazing Kelly Wearstler bengal bazaar pillows, and any sources that you may want to know about.